I m a Portuguese teacher of English. I like to use different materials in class... But time is not always enough...And I believe that cooperation among teachers makes work easier... for ALL! SS write the parts of the body. I usually use cartoons or their fave TV characters! They love these WSs. 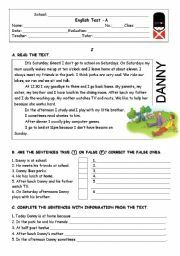 A test divided into 4 parts: I - comprehension exercises; II - grammar (to be, poss adj and pers pron); III - vocabulary (ordinals, dates, countries and nationalities); IV - composition. I hope you like it! I used it with my 6th form class. 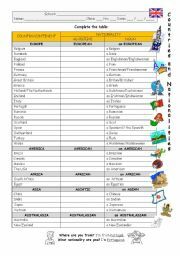 Children must fill in the table with the right nationality (adjective). Page 2 has the solution. 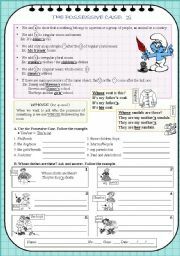 A WS about the possessive case - basic rule and some excercises (using clothes). 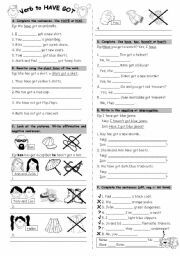 Different exercises to practice the verb to have got: a) Complete with have/has b) Rewrite with the short form c) Write aff and neg sentences according to the pictures d) Complete questions and answers e) Write in the neg and int form f) Complete (aff, neg, int). 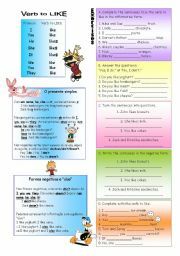 It has got a simple explanation on the verb, then you have some exercises where SS must use all the forms (affirmative, negative and interrogative). School parts vocabulary: classroom, lab, computer´s room, music room, art room, gym, library, canteen, coffee bar,student´s room, toilet, headmaster´s office, school office, stationer´s, reprography, ward, staffroom, reception, hallway, playground, sports field, swimming-pool and auditorium. Body parts presentation (27 slides)- SS learn body parts vocabulary with Lizzie McGuire(this ppt was made according to one of my WS - eslprintables20081126103233543591015). I hope you to enjoy it! 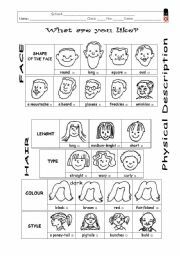 A vocabulary presentation about school subjects: - PART 1 - English; Portuguese; French; Maths; History; Geography; and Science; - PART 2 - Chemistry; Physics; Music; Art; PE; Religion; and ITC.